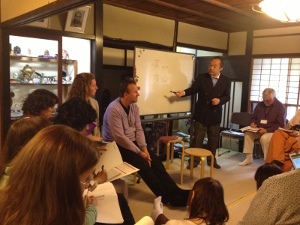 Our organization holds various seminars, workshops and exchange sessions as a place of learning lifelong skills and to promote Reiki Ryoho for the general public. We will conduct our work to encourage personal development and creative activities for each Jikiden Reiki Shihan and Shihankaku who are active in Japan and abroad. Our commitment is to contribute to create a peaceful society in harmony with the natural environment by having the physical and spiritual wellbeing and happiness of each family member. Family is the basic unit of society. Dragonfly has traditionally been regarded as the symbol of an indomitable spirit. Using this dragonfly for a motif, we depict an image of us striving for the spread of Reiki around the world. The colors respectively symbolize nature: blue representing the ocean, orange representing the earth and green representing the forest. "International Jikiden Reiki Association” is ready to share the Reiki without Western influence launching it out into the world, in order to contribute well-being through Reiki to all people. The mission of NPO International Jikiden Reiki Association（NPO-IJRA）is “Connecting, Bonding and Spreading”. There are many people who have not met Reiki yet, those who may benefit from Reiki, and those who do not know Jikiden Reiki. We created this website with the purpose that Jikiden Reiki could provide an opportunity to "Know, experience and learn about Reiki" to those people. The goal of this website is to be a great tool for people to connect with Jikiden Reiki in various countries and regions. Jikiden Reiki Shihan / Shihankaku can join NPO-IJRA and the members can publish your own activity center on this website. To fulfill the purpose of this website, we hope many Jikiden Reiki Shihan/Shihankaku will join and make your activity center public through this website.